I am looking for some help from someone that owns the MODX8 – with measurements. I want to have a studio desk built and need some measurements. If anyone can help – please private message me. If you need the dimensions of the MODX8 it is 1144mm x 134mm x 404mm. Does that help? I would post a picture of what I am looking for to make it easier to understand - but it seems you can't post pictures on here unless they are already on a website. The height does include the control knobs. Yes, I sent it in to get the key clack fixed and when it came back it wouldn’t even switch on... after 5 weeks. Pretty disappointed by Yamaha there. Disappointing is an understatement! Did they give a reason as to why it would not now power up? No offer of a temporary replacement? Hey, thanks - I wish you could too! Sure hope Yamaha is aware of this... Saul...? Yamaha are certainly aware that some people have had problems but I don't think they consider it a widespread issue. 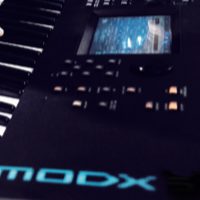 I had some issues with my MODX8 locking up when I played the keyboard hard. At first, I thought it was the keyboard mechanism but when I changed to another electrical outlet, the problem went away. It might have had something to do with the power supply as well as I heard of a similiar problem someone was having with an SY85. Symptoms were, screen corruption or dead screen (no backlight - powered off), Super Knob and LEDs to the left of Super Knob remained lit but all LEDs/switches to right of Knob were dead, Note(s) stuck on or silent. It appeared to be a classic case of insufficient power as in what happens with computers when power issues arise. In my case I tried two power supplies which worked before at the same power outlet. No reaction at all. Saul, sorry, overlooked your earlier question: no, no temporary offer. Also the Thomann guy himself was pretty disappointed by the result. He could not give any reason for the problem, but promised he would try to make pressure to Yamaha for a speedy repair. Always difficult for dealers as they are stuck in the middle and simply handle the transport of the keyboard from customer to manufacturer. Having said that and if EU law is the same as UK...which it should be at the moment, then the contract is between you and the dealer, in this case Thomann and THEY need to sort it out...although I am not sure that helps much at this stage, not unless you were asking for a replacement, which personally I think you are entitled to. If you want to pm me your details incl the serial number of the keyboard I could run it by Yamaha Europe and see if we could move things along a little?